Yeah, you hear it all the time, but here’s actual proof. Some time ago, my doctor told me that I really needed to get in 30-minutes of cardio three times a week. Eventually, I broke down and started hitting the YMCA on Mondays, Wednesdays and Fridays. The problem is that work at the ad agency can go sideways at a moment’s notice. For example, last week, there were so many fires going on, I just never found the time to hit the gym. So, when I had an afternoon meeting in the south end today, I could had hitched a ride with co-workers heading that direction….or, I could work out at the Y and meet them there. It would have been so easy to just skip the workout and go with them to the meeting, but I stopped by for a quick sweat-fest. When I headed back to my car, I gave one of them a call. No answer. I called the other one, he wasn’t answering either. Strange, I thought. 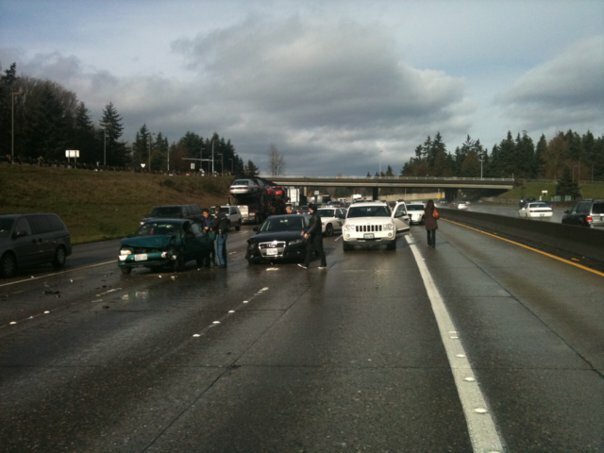 Then, a couple of minutes later, my phone rang and it was my buddy Kevin…who let me know that he, along with the other co-worker in another car, were in a 15-car accident-fest in I-5. He was actually calling me from the center of the freeway in a parking lot of stopped cars. Both are fine, but there cars are a little worse for wear. But had I skipped the workout, I could have been sitting there amongst a bunch of ticked-off commuters calling their insurance agents. When I got back from the office, I found out that another one of my co-workers had called the front desk to warn Kevin and Rachel that there was some really bad traffic on I-5. The employee was informed that it was because of their accidents. All this, while I was wheezing away at the elliptical machine. See–exercise IS good for you! If you know Kevin, one of the first things he did was post a picture of the accident scene to Facebook. No one was surprised.